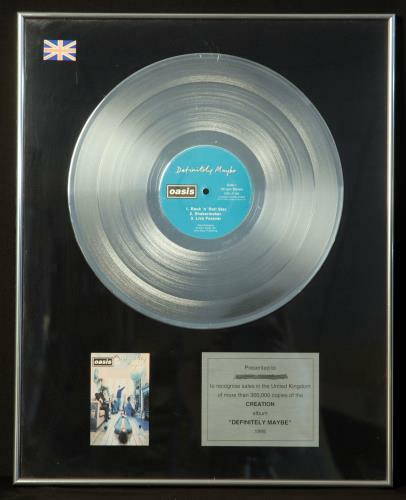 OASIS Definitely Maybe (Rare official 1995 UK Creation Records in-house Platinum Sales Award presented to recognise sales in the UK of more than 300,000 copies of their classic debut album. The silver coloured LP is mounted above a copy of thesleeve artwork and custom dedication plaque. Measures approximately 16" x 20" - framed and glazed. This award would look fantastic on the wall of any Oasis fan! ).